Epic today announced Fortnite v7.30's first Content Update, which'll arrive tomorrow morning, February 5 at 8 a.m. Eastern. 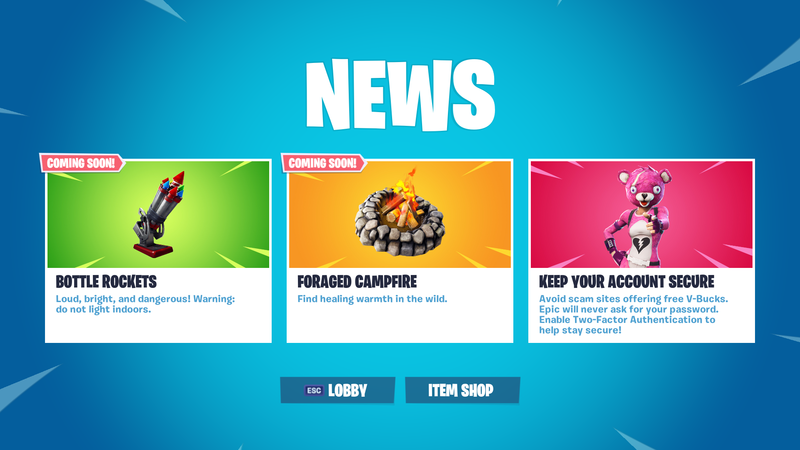 According to today's login screen and traditional Reddit teasing, the patch will introduce two new items to Battle Royale: Foraged Campfires and Bottle Rockets. Scuttlebutt 'round the tubes is that Foraged Campfires will be stationary, naturally occurring healing spots, which require a donation of wood in order to activate. This contrasts the existing campfire, which players can place wherever they like to create a temporary healing zone. There's no info yet on whether Foraged Campfires will be multi-use, unlike their older sibling, so we'll have to find out when the game updates tomorrow morning. Bottle Rockets, meanwhile, are anybody's guess, so here's ours: Based on today's login screen, Bottle Rockets look at first blush to be a stationary weapon, similar to the Mounted Turret. Players may be able to place the ordinance on the ground, aim, and fire a barrage of rockets for fun and profit. On the other hand, it's also possible that Bottle Rockets are some new form of mobility item, one that players find on the island and use to rocket-surf to other locations. Again, we'll find out for sure tomorrow morning, and if we're right, you owe us $20. No take backs! Creative Mode will surely receive something in tomorrow's update, in addition to the new campfires and fireworks. As for what that might be, however, Epic has given no indication beyond promises of continued support. Save the World, meanwhile, has settled into a groove as of late, and will probably receive a new weekly Frostnite challenge, along with a new character and/or weapon, depending on what the bones say.